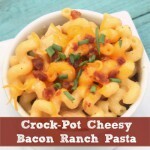 This easy simple recipe for Crock-Pot Cheesy Bacon Ranch Pasta is a favorite with the kids. I love the combo of cheese, ranch, bacon and pasta for dinner! This recipe is a favorite of my kids. It is pretty much like a saucier version of macaroni & cheese. The addition of a little bit of bacon adds a nice flavor and the sauce is saucy and cheesy. In this recipe I used a pouch of real bacon bits, but I often buy bacon in bulk when it goes on sale at the grocery store (my stock-up price is $2.99 lb) and I buy several pounds at once. Then, when I get home I cook it all up and freeze it for recipes, like this one, that call for cooked bacon, or to just make breakfast easier in the morning. I know some people balk at the use of canned soups, but I am not one of them! In this recipe the cheddar cheese soup adds the cheesy stuff that makes this recipe yummy. I suppose if you want you could experiment by adding real cheese, maybe a cheese that melts nicely. Or I have had success with melting cream cheese and cheddar cheese in the slow cooker without getting an oily mess like you get when you just melt cheese. And for simplicities sake we have a packet of ranch dressing. On this one, I use homemade. It is cheaper to make it myself (I even use herbs from my mini herb garden that I have dried myself in my food dehydrator) and I actually prefer the flavor of homemade over the store bought packets. You can find my recipe for homemade ranch dressing mix here. It really is tasty. But hey, the store bought kind will work just as well! I hope you enjoy this recipe for Crock-Pot Cheesy Bacon Ranch Pasta as much as my family and I do! 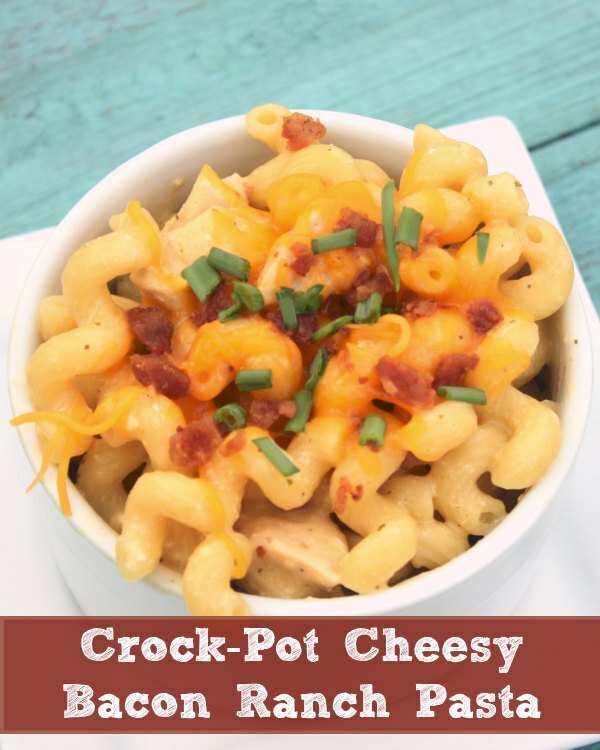 This easy recipe is a family favorite and is super easy to toss together in the slow cooker in the morning or afternoon and have dinner on the table. Add chicken, cheddar cheese soup, ranch dressing mix, sour cream and real bacon bits to the bottom of 4 - 5 quart slow cooker. Cover and cook on HIGH for 3 - 4 hours or LOW 6 - 8 hours. Near the end of the cooking time for the chicken, cook your pasta according to the directions on the package and cook until al dente, drain. Serve chicken, with sauce over cooked pasta. Garnish with bacon, cheddar cheese, or green onion if desired. This recipe is easily doubled if you have a larger amount of people to feed. 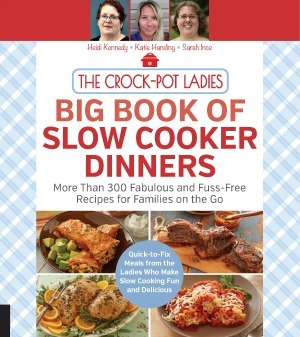 Just double the ingredients and cook in a 6 quart crock-pot. The cooking time remains the same. I’m not sure. I would guess you could reduce the cooking time since the long cooking time in this recipe is the make sure the chicken is cooked. Sorry….one more question… could you cook the pasta in the sauce? You probably could. I just find it tends to come out mushy whenever I attempt pasta in the crock. Although the other Ladies have had better success with it. Add chicken cooked or uncooked? On the cheddar cheese can it says to mix with one cup of milk. Do you use the milk in this recipe or just the cheddar cheese soup that is in the can itself? Just the soup from the can, no additional milk. Came across the recipe and it sounded delicious, and so wanted to try it. Thought I was looking for a recipe to use with boneless skinless chicken breasts, which I was. However, upon returning to the freezer, realized that it was boneless pork chops instead of the chicken breasts. I went with it. The family really liked it! I will try it with the chicken, but just wanted to let you know that it works really well with pork chops, too. Thank you for the terrific recipe that now has a place on our meal planning rotation. Good to know it works with pork chops too Kimberly! Thanks and I am so glad your family enjoyed it!